Oh boy, am I ever going to be unpopular after this…!! Best to apologize in advance if I step on a pinky toe… Sorry! You know, that night when “scary is good and fear is fun”? My choice is to not celebrate Halloween. Okay, so you do, but at least the costumes are cute and the pumpkin is smiling – yeah? Take a slice of moldy bread and smear on a nice thick layer of peanut butter and it looks really good – but the bread is still moldy. Yep, I can almost feel someone slapping my face now “How dare I – who do I think I am”… I’m a nobody. Pay no attention to me… after all, it’s still your choice. Yeah – that’s where my internal struggle begins. Honestly, it freaks me out. Just the look of the decorations gives me the creeps… which in turn is actually the main idea, right? Or maybe I’m wrong… But if it creeps me out, does it come from Jesus? I have no intentions of digging into the Celtic “Samhain” or the Catholic church’s “all saints day”. If you have the interest, there’s about a million websites out there all speaking for or against Christians celebrating Halloween. Since when are scared kids fun: Top FEAR pics of the WEEK? Seriously?? This is something odd and scary. Then I see kids dressed up in anything between princesses, superhero’s and zombies and they learn that this scary stuff is fun. It’s not fun. It’s scary. Fear is not fun and fear is not from the Lord! Dwelling on the Lord… I can’t find any place in the Bible where the Lord says I should celebrate (or pray to) His dead saints nor dress up like something only the evil one would do anything, to make us wear. A smiling devil?? Yeah, something’s wrong here! “Do not have anything to do with sorcerers… evil… darkness…” etc. Want the verses? Try Ephesians 5:8 and 11, Galatians 5:19-20, Deuteronomy 18:9-13 and I’m sure there’s more. Halloween, as far as I can see, does not celebrate anything that has to do with God. Because only good things comes from God. When we try to make scary costumes fun, we are teaching the kids exactly that. Is that really good? pure? holy? kind? Halloween is not a celebration given to us by the Lord God and that’s why I’m the “evil mom” who places the huge burden upon my daughter’s shoulders, to say NO when her friends in school want her to celebrate Halloween! – Praise Jesus, for He gives her the strength to speak up and say no. Gosh, I’m so proud of her! But I still love you! May Jesus Bless you all and keep you safe from evil all the days of your lives. Amen. It’s a rare thing when I choose to reblog a post, but this post really nailed my feelings when it comes to parenting! I’m so grateful because it highlighted something I needed to accept: This is my life, even if I don’t want it to be… Please visit the blog and have a read, especially if you are a special needs parent, but even if you’re not, this post can enlighten you. Have a good read ❤ and don’t give up! 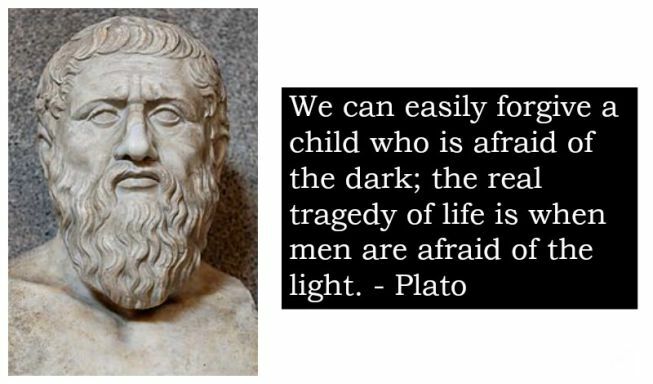 A fellow blogger who really inspires and cares posted this and I thought I would post the words of Plato along with the link to The neighborhood blog.